I love some music the first time I hear it but then it starts to sour by the third time. Other music I hear and think “huh?” but eventually become a fanatical convert (Bartók was once like this for me but I understand most people don’t have the time nor inclination to stick with music that is an acquired taste.) There is a third category of music that causes a visceral reaction and continues to reveal itself every time you hear it. "Black Angels" fits in that last category for me and it will for you, too. 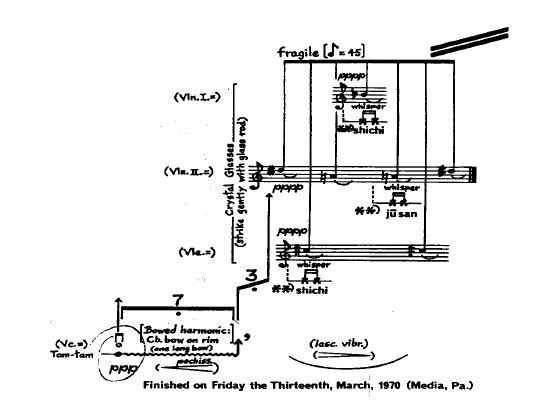 George Crumb studied music in West Virginia, Illinois, and Germany before returning to study at the University of Michigan, from which he received his D.M.A. in 1959. He has a long association with the University of Pennsylvania, where I am Director of the Chamber Music Department and casts a huge shadow despite retiring before I arrived. He has received the Pulitzer Prize, a Grammy Award, a Fulbright Scholarship, Rockefeller and Ford grants, Guggenheim Fellowship, and numerous other awards. It’s more than 40 years old now, but I remember that it was a very difficult piece to write. I think that the upset in the world found its way into the music, which happens so frequently. There are many works throughout music history that are reactions to political events, but in this case it kind of crept up on me. At a certain point, I realized that it was becoming a reflection of a lot of the anxiety and uncertainty of those days. It was a pretty bleak period. And that coincided with all of the protest movements around the country, which kind of led to a whole new kind of America. The piece is full of extremes: instruments play beyond their design limits and extended techniques are employed such as bowing upside down or tapping the strings with glass rods. In addition to chanting in Japanese, German, Russian, Hungarian, and Swahili, the musicians are assigned other instruments including maracas, gongs, and tuned crystal glasses. I first heard "Black Angels" when I was 14 at a summer music camp. The faculty worked at night after we were in our bunks and through the forest we heard horrifying sounds; it remains the most terrifying piece of music I know. Crumb pushes the musicians to their physical but also spiritual limits. Sometimes art needs to explore regions that prefer to remain beyond the light of day. From here it gets technical; you don’t have to read on to appreciate the music. The numerous quasi-programmatic allusions in the work are symbolic although the essential polarity – God versus Devil – implies more than a purely metaphysical reality. The symbolic presence of Good and Evil is a thread that runs through every measure, sometimes represented overtly in entire movements. Crumb represents the depths of Hell in the fourth movement, “Devil-Music,” by having the second violin and viola play the Latin Dies Irae (“Day of Wrath”) with a crunching sound which activates harmonic partials so that the pitch sounds below the note they are playing (I was not aware this was physically possible). Simultaneously, the first violin has a cadenza characterized by distorting the sound so much that pitch is completely lost. This is the voice of the Devil! In contrast, the crystal glasses in the tenth movement, “God Music,” create an astonishing angelic sound accompanied by a lyrical cello solo representing the Voice of God. The sixth movement, Pavana Lachrymae (a pavana is a slow 16th century dance, lachrymae means “tears” in Latin) contains an extensive quote from Schubert’s “Death and the Maiden” (Der Tod und das Mädchen) rendered in a Medieval style reminiscent of early church music. This contrasts with the abundant use of the “Devil’s Trill” throughout the piece, a reference to Paganini, suspected by many of his compatriots to have made a pact with the devil in order to play at a level of virtuosity the world had never witnessed. The work portrays a voyage of the soul. The three stages of this voyage are Departure (fall from grace), Absence (spiritual annihilation), and Return (redemption). These 3 sections are divided into 13 movements (“Thirteen Images from the Dark Land”) in symmetrical pairs, the seventh movement standing as the lynchpin in the center. 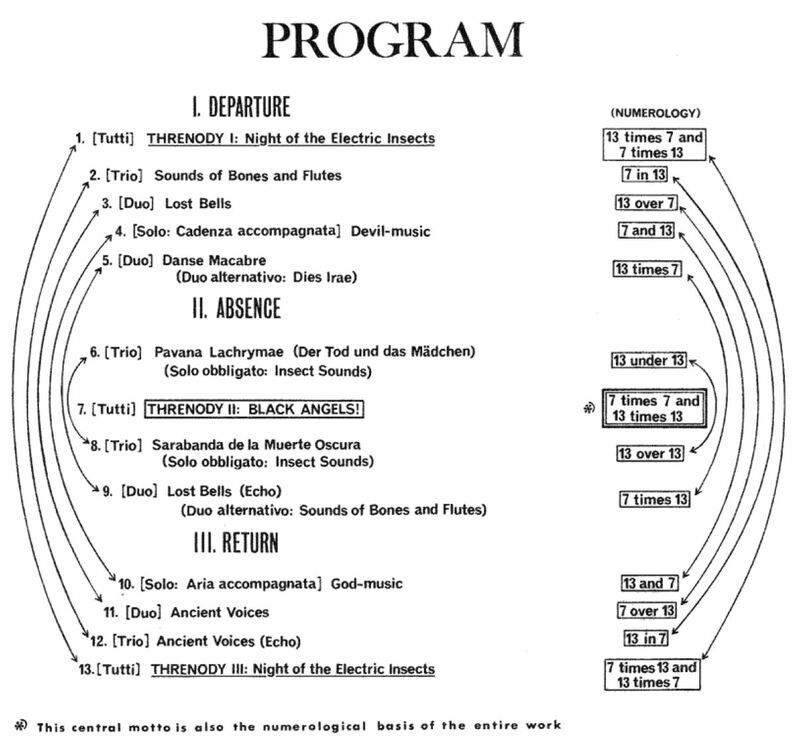 “Devil-music (no.4) and God-music (no.10) are symmetrically placed and conceptual opposites. The two Medieval-sounding movements, “Pavana Lachrymae” (no. 6) and “Sarabanda de la Muerte Oscura” (no. 8), stand on each side of the central movement (no.7) and revolve around death. The combinations of instruments used in each movement (quartet=4, trio=3, duo=2, and solo=1) is arranged in the piece as a whole as a palindrome: 4, 3, 2, 1, 2, 3, 4, 3, 2, 1, 2, 3, 4 (in other words, the first movement is a quartet, the second is a trio, and so forth). This parallels the overall arch-like form of 3 sections divided into 13 parts with the peak at 7. The number 13 is associated with Evil but can also stand for good (Jesus + 12 disciples). The number 3 can signify Good (The Holy Trinity) but also Evil, with the omnipresent use of the tritone, a musical interval so dissonant that in the Middle Ages it was banned by the church and considered the devil’s interval. In various spots, melodies consist of 13 notes or are 13 measures long. Within a melody, musicians may be asked to repeat a note 3, 7, or 13 times and sometimes Crumb instructs the musicians to repeat passages 3, 7 or 13 times. The last movement, “THRENODY III” brings back the “electric insects” with four overlapping statements (each instrument) held each for 13 seconds. Yes, this business of 7s and 13s came into the music. It was more technical, structural. I got carried away with the Friday the 13th thing. I think it is important in all music [not to reveal too much]. Beethoven doesn't give us all of what's in his mind. There are references to Shakespeare in his letters, but not in the score. 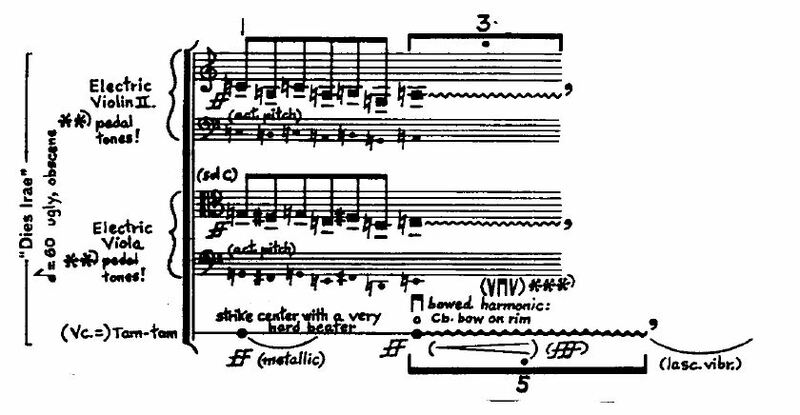 Mahler's Third originally had descriptive titles for all of the movements, but he dropped them. Even more abstract music is probably connected with other ideas -- poetry, landscapes, and other things. [It's better to] let the listener make the connections. There is nothing like Black Angels in the history of music. The experience can be deeply harrowing yet profoundly spiritual. The piece is about Good and Evil; not the struggle so much as that they coexist. It is about 30 minutes long; lean back and disappear for a while. Crumb, George. Front matter. "Black Angels." New York: C. F. Peters. 1971. Crumb, George. Liner notes. 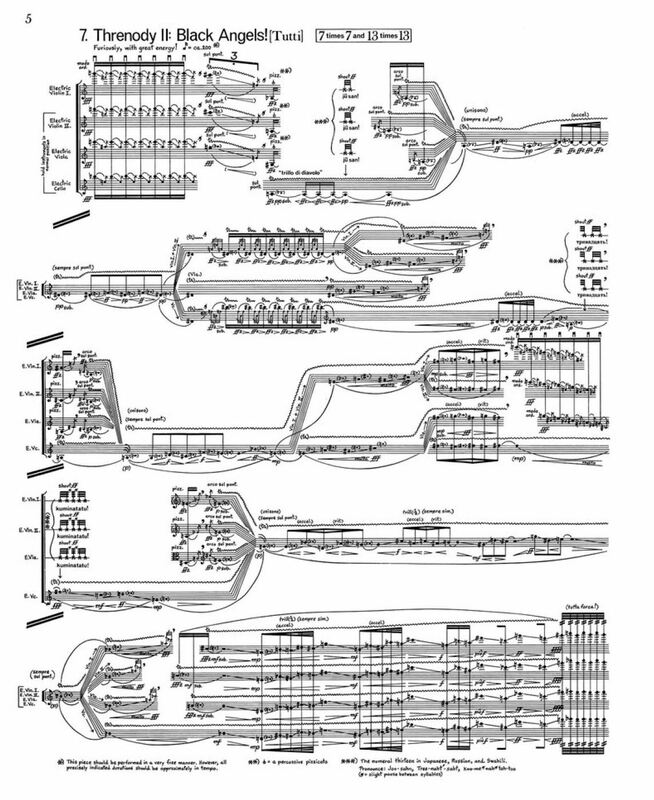 George Crumb/Charles Jones, Black Angels for Electric String Quartet/String Quartet No. 6, Sonatina, with the New York String Quartet, CRI SD 283, 33 ⅓ rpm. 1972.